Ann and I had been comparing pictures of our log cabin twills when she commented to me that mine looked different from hers. And it was. Hmm, I wondered, why was that. Several factors came to mind: yarn, sett, or number of “logs”. But I wasn’t sure any of these were the correct answer. After contemplating for a while, it finally occurred to me to go and put my granny glasses on and take a closer look at the draft. Looking more carefully, I realized that the stripes of color on it were not one end each as I first thought, but two. Ahh, so that was it! 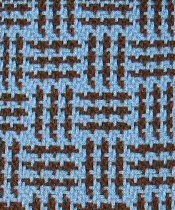 I immediately set out to weave another sample, this time following the draft to the letter. As you can see, the effect is different. The cleverness of doubling the end colors is that it preserves the log cabin look, where as mine were single ends of color, resulting in a totally different effect. 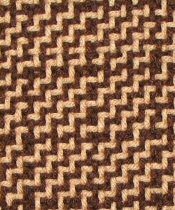 My warp order was the same as traditional log cabin, but the twill structure revealed an step-like appearance which had fascinated me as I wove it. Of course, all this only validates the adage that we, as fiber and textile artists, don’t make mistakes, we simply create design elements. I suppose that the transition between the two depends upon how well we can transform that mistake into a desirable outcome. For myself, I only wish all my design elements turned out so well. What a nifty discovery, Leigh. You have sharp eyes, not to mention a sharp mind!